The Woody Guthrie, a replica of the popular gaff-rigged Hudson River sloop from days of yore, has since 1978 been in service to the public in the form of free rides and education five weekday evenings a week. 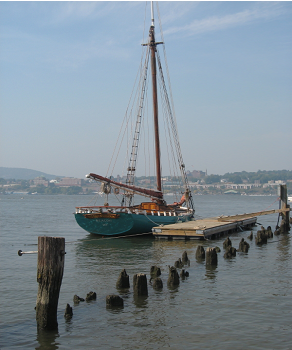 Pete Seeger had the Woody built to support the mission of the larger Hudson River sloop replica, the Clearwater, built ten years before the Woody to promote the clean-up of the Hudson River and to keep the river open and accessible to all people. 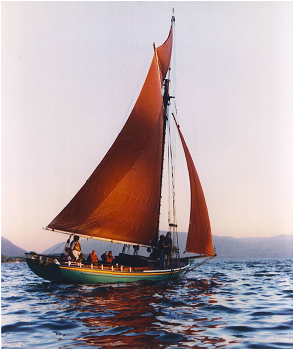 From its launch date in 1978, the Woody has given thousands of people their first experience on a sailboat and their first experience of beauties of the river and the surrounding mountains from the vantage point of the river. The guests are given information concerning the history of the river, the boat they are sitting in, the mission progress being made, and are asked to help us in our mission in any way they can.